Benjamin Franklin was a renowned 18th century American scientist, politician, author and diplomat who is often referred to as “The First American”. He was the 15th child of a soap and candle maker named Josiah Franklin and received no formal education beyond the age of 10, when he was apprenticed to his father as a candle maker and later to his elder brother James as a printer. However, he supplemented his lack of schooling by becoming a voracious reader. When James refused to accept his younger brother’s submissions, Benjamin submitted a series of letters to his brother’s paper under a pseudonym. These were well received but when James discovered the writer’s identity, the two had a falling out and Benjamin moved to Philadelphia to pursue his own business. Franklin also lived in London for three years, where he read extensively, attended theatre and enjoyed a literary life. It was here that he published his first pamphlet titled “A Dissertation upon Liberty and Necessity, Pleasure and Pain”. He returned to Philadelphia in 1726 to find out that the woman he had been courting, Deborah Read, had married. Nevertheless, after the disappearance of her husband he married her in 1730. Back in Philadelphia he began to pursue a number of activities. He formed a club of young men and called it “Junto” which was a social study group. He also published a pamphlet on “The Nature and Necessity of a Paper Currency”. Franklin was chosen as the official printer of Pennsylvania after he bought out an existing newspaper called “The Pennsylvania Gazette”. One of his most famous publications is “Poor Richard’s Almanack”. His business was successful and as Franklin became wealthier, he bought more property, businesses and real estate. He greatly contributed to the development of people and society around him. For instance, he established a library to lend out books and encourage reading and set up a fire fighting company as well. Franklin’s scientific pursuits earned him just as much fame as his entrepreneurial and diplomatic ones. One of his most valued contributions is in the field of electricity. He proposed the fluid theory of electricity and showed that electricity flows from a positively charged object to a negatively charged one. He coined scientific terms that are still used today such as conductor, charge, battery etc. One of his most famous inventions was bi-focal spectacles that enabled both near and far sighted people – a condition known as “presbyopia” from which Franklin himself suffered – to use one pair of spectacles for both purposes. Another one of his famous inventions was the Franklin stove. It was an alternative heating source to a fireplace, that used up less wood and caused less smoke. It consisted of a cast-iron furnace that would provide heat in all directions. He also mapped the Gulf Stream on his numerous journeys across the Atlantic Ocean. Some of his other inventions include a lightning rod to protect buildings from damage caused by lightning, a flexible urinary catheter to drain the bladder of patients suffering from kidney stones or other diseases, and an odometer to measure the distance travelled by carriages. Franklin also had a successful career as a diplomat. In England, he was a representative of first the Pennsylvania Assembly, and then Massachusetts, Georgia and New Jersey. In 1775, he was elected to the Congress and as “postmaster general”. He was one of the select few men who drafted the first constitution of the United States of America. He was also the first U.S. ambassador to France and was on good terms with King Louis XVI. He was instrumental in the signing of the peace treaty with England in 1783. He was actively in support of abolishment of slavery and served as president of the “Pennsylvania Society for Promoting the Abolition of Slavery”. 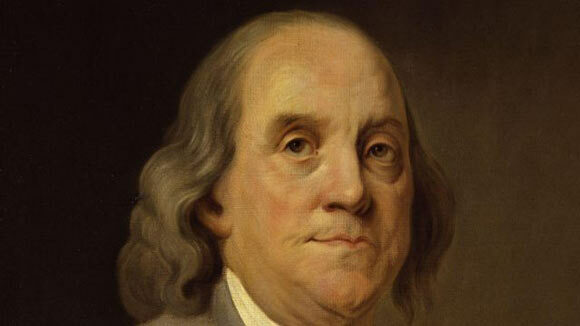 Benjamin Franklin died on April 17, 1790 in Philadelphia at the age of 84. His funeral was attended by more than 20,000 people. His legacy as one of the Founding Fathers of the United States will remain in the hearts and minds of Americans for a long time to come. His face adorns the $100 bill as a reminder of his monumental contributions.